Erin’s a petite powerhouse with a blond Michelle Williams ish pixy cut. She’s humble about her sense of style, but she does a great job of pairing well-cultivated, classic shapes with artsy twists and a hint of luxe. I needed to find a bag that is streamlined and doesn’t block her frame, can blend with her varied wardrobe, and offers a hint of luxury. Erin sometimes carries a clutch inside of a larger bag (the Nesting Doll method), and she travels a LOT. Fun Shopping Challenge! I’ve been obsessed with patent leather since I was 10 years old. God- remember these? I loved those shoes!! I even decorate in the equivalent of patent leather, which is lacquer. I have a white lacquer dining table, a red lacquer desk… but I digress. So #7 seems the most delicious to me… Shiny! The shape and color of #5 could also keep me warm on a cold winter night. Now I want Doc Martens. And I would buy them if you promised never to come back to San Diego because if I bought them and you caught me with them, I’d be dead. I always worry about buying white leather and have it not look dirty for whole year. 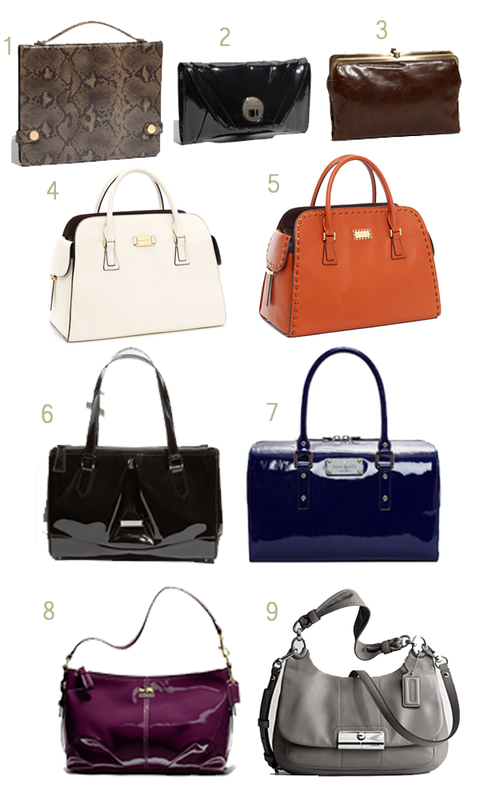 Probably my favorite is the Kate Spade. Not a surprise since I like her as a designer. And I think it incorporates everything you said about Erin. But I can’t even FATHOM spending this much on a bag. Even if I’m keeping it for a year. If you wore those doc martens with a baby doll dress, plucked eyebrows, and dark red lipstick, I would probably hug you, pretend that it was 1992, and force you to watch Heathers with me. Regarding white bags: I swear by them. I think they are chic, and I love how effortlessly they go with any outfit. If you get a high quality bag, they should be able to take the wear and tear and be easy to clean. At present I’m rocking a Kate Spade Stevie in white patent leather. Aside from the fact that it is HUGE (I could fit a ham leg in there) It’s doing great. I’ve also had a couple of white hobo bags from COACH in white that have totally lasted. Come to think of it, I had a green COACH bag that didn’t do as well as the white ones. Short story long, don’t be afraid of white purses. They are awesome. The one that I had the biggest emotional reaction to was actually #3. It looked like a bag that was destined to be in the permanent heirloom archives that I leave to my daughter when she heads off to New York to be a hand model. I would be totes stoked to own #5 for sure (see what I did there?). It makes sense that it comes from Michael Kors, given that they are both orange and leathery… and AWESOME. I never would have pegged you for a black/studs kind of girl! And I encourage you to reconsider the green bag for daily use – wearing a pop of color in your handbag is a great way to add interest to your outfit. I never buy brown or black bags because I think that other colors can actually go with more stuff sometimes. I have a very broad opinion that all solid colors go together (which I am sure could successfully be challenged), which is why I was comfortable carrying a sage green bag for most of last year. Got tons of compliments. Give it a shot! I’m going to do some research for you on vegan handbags and see what I come up with. I have a friend who just opened a planet-conscious show and accessories shop in North Park, called Elos shoes. You should totally check it out, and let Lisa (the owner) know that I sent you. She’s amazing. She carries vegan saucony originals and some hemp shoes. black with studs – this is me branching out 🙂 Me and bags that even look like leather is a new thing. I will pull out my green bag and use it for awhile. I do wear solids together a lot. I think it works most of the time. Elos needs more information on their website. Like hours 🙂 But i will totally go check it out. Try the green and send me a pic! Elos: totally. They just had their grand opening a month ago, and as an All American Small Business, they’ve been busting buns to get everything together. I’ll pass your suggestion along to Lisa!